It has long been recognized that applied pressure can significantly change the conventional patterns of chemical reactivity predicted by the structure of the Periodic Table. At the same time, among thousands of known interactions between elements in the Periodic Table, there remain chemical bonds that are curiously absent. But is high pressure sufficient to promote a chemical reaction between two elements that do not react even as molten liquids at ambient pressure? This is the case for elemental iron and bismuth, and no chemical bond between atoms of these two elements has yet been observed. This problem has particular relevance in current materials science with respect to the existence of superconductivity in iron pnictide systems such as the parent material FeAs2. Postdoctoral associate James Walsh and graduate student Samantha Clarke, from the group of Danna Freedman (Chemistry) at Northwestern University, working with CDAC Academic Partner Steven Jacobsen (Earth and Planetary Sciences, Northwestern University) and co-workers at HPCAT, have now succeeded in synthesizing the intermetallic FeBi2, the first compound to contain an Fe-Bi bond in the solid state. Using diamond anvil cell techniques and beam time provided by CDAC, the compound was synthesized at 30 GPa and 1500 K under laser heating at HPCAT beamline 16-ID-B. 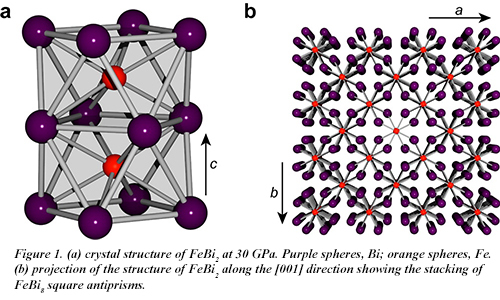 FeBi2 adopts the Al2Cu structure type and features iron atoms each coordinated by eight bismuth atoms in a square antiprismatic arrangement with an Fe-Bi distance of 2.719 Å (Fig. 1). This work has been highlighted by the American Chemical Society journal ACS Central Science and by Chemical and Engineering News.